"We should never forget our culture. ", is something you would hear from a lot of people in India. During this conversation neither the speaker nor the listener gives a thought about "What is Indian Culture?" Arranged Marriage: It was a shocking revelation to me that arranged marriages did not originate in India(or the East), but in Europe. It was a common practice in Europe for parents or relatives to decide for their children's marriage based on factors they thought would enhance their social stature. 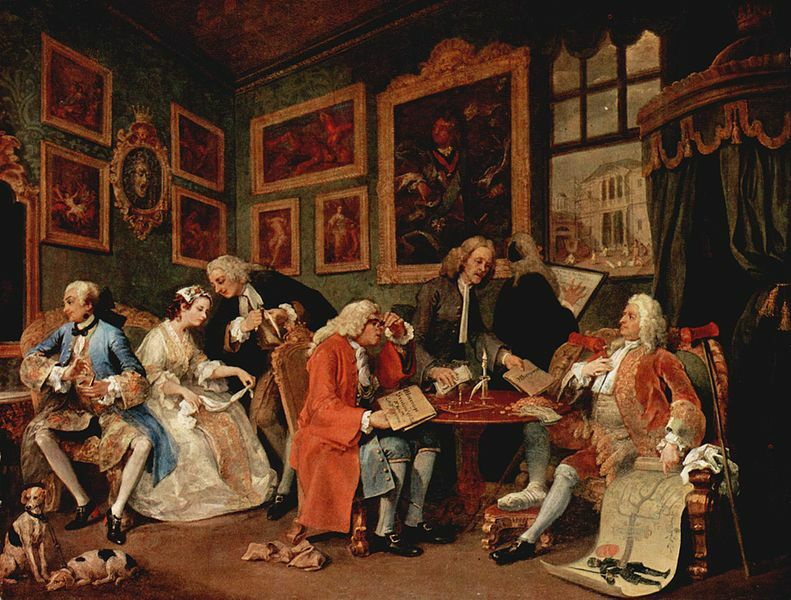 Evidence was found that money was a prominent aspect in most marriages and brides were even sold. 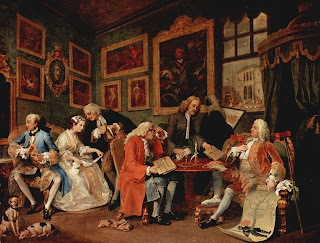 In 1745, William Hogarth(an English pictorial satirist) released six pictures on arranged marriage practices. These practices slowly disappeared from the West and modern world saw them alive in the East. Indian Culture? Quite contradictory to the myth, ancient India gives no proof of arranged marriages until 500 BCE. Is it a coincidence that the first ever foreign invasion on India was actually recorded about that time? Marriage à-la-mode : The Marriage Contract. Arranged marriages are a western concept sitting in our minds disguised as our own Culture, whereas the real Indian culture gives full freedom of choice for marriage to individuals. The practice of Swayamvara is a prominent proof that our culture actually gives women the right to choose their own partner and men to freely take part in any such arrangement. It is to be observed that preference is given to the bride than the groom. Hence, Indian Culture gives full authority for everyone to exercise their choice with regards to marriage and protects the rights of women by giving them an upper hand in this institution. Evidently our society thinks oppositely and we can see how the western invasions have already killed our culture. Indians, who recite the Ramayana and Mahabharata daily, have forgotten that both the epics are centered at the mistreatment of women and the use of force against their rights of Swayamvara. Bhishma, in Mahabharata, had to lay on a bed of arrows as punishment for denying this right to Amba, Ambika and Ambalika. When Amba mentioned that she is in love with Shalva Kumar, Bhishma let her go as it was against Dharma(his righteous duty). This clearly depicts to what level we understand and follow our religious and cultural texts. Ravana abducts Sita and martyrs Jatayu. A miniature of the Basohli School, attributed to Nainsukh. Choice of career: Indian parents also intervene in their child's decision for career. A boy or a girl is said to be well cultured, if they follow the decisions of their parents. Parents train their children from a younger age to pursue a certain profession they think is better for their children. Any deviation from the path is met with aggressive verbal and sometimes even physical measures. Indian Culture? and the attitude of parents on their children. Ancient Indian society had a very strong education system and is known to be the home of the first ever universities in history. Gururkuls were prominent with a head teacher or guru. Most children stayed with their parents until they reached a certain age, after which they were sent to a Gurukul. In many cases, Parents did not even see their children until they completed their studies and hence, intervention in career choices can be completely ruled out. If we look at the Ramayana, Rama is sent to Rishi Vasishta and that there is no intervention by the royal family in his education. Similarly, Acharya Drona teaches Pandavas and Kauravas equally. At a Gurukul, the teacher provides education on a wide variety of topics essential for every student; such as martial art, law, religion, culture, scientific knowledge, politics, arts, medicine, day-to-day living, philosophy etc. A Guru would provide essential elementary knowledge to his students and then observe what talents they excel at. For instance, Yudhisthira was good with a spear, whereas, Bhima was comfortable with a mace. Both of them have the preliminary knowledge of the use of weapons, however they are given complete freedom to choose their weapon. Furthermore, a student is given full freedom to choose his own Guru as seen in the case of Bhima. He chooses Balarama as his Guru to learn the martial art of Mace Fighting. Clearly, the real Indian culture does not allow the interference of parents in a child's decision for career and teachers freely allow their students to pursue the path they feel is right for them. Indian Culture is dynamic and provides freedom to all individuals. Hence, we see the two most common mistakes committed by us in identifying Indian Culture. The pseudoculture disguises itself in our society and propagates as Indian Culture. It needs a strong effort from the young and the experienced to revive the dead Indian Culture. Quite an interesting post Ballu :) I think the movie "SAG" was quite funny in its own way. The arranged marriage concept was prevalent in all aristocracies, even in India since times ancient. I guess we people are still stuck with it in a way. Hopefully times are changing and with it are the attitudes as well. I hvnt seen the movie 'SAG'.the whole point of the of the article is that Ancient India actually gave freedom of marriage and career and was very liberal. Its the medieval ages, with foreign invasions on Indian people and culture, that saw arranged marriages and a plethora of misinterpretations in practices. Typically people think that Indian Culture(since ancient times) started and promotes arranged marriages and the interference of parents in the ddecisions of their children's life. However, our own scriptures show that our culture is very liberal and I am talking about culture based on religious texts. So the change should not be like we r changing from Indian practices to western, instead should be that we are getting back to real Indian Cultural Practices. WOW! I absolutely enjoyed reading this article!!! You have revived our age old culture and surfaced it in your blog! HATS OFF TO THAT! And arranged marriage concept is a shocker to me after you mentioned that it was never in our culture. And i am cursing myself for being too dumb that it dint strike me that swayamvar was a means of expressing a woman's freedom and respect for her choice!